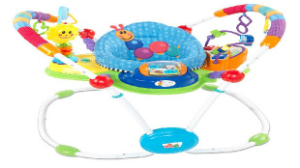 A baby toy is being recalled in Canada and the U.S. after reports that children have been hurt. The "sun toy" attachment on the activity jumper can rebound with force and injure the infant, posing an impact hazard. About 8,500 hundred were sold in Canada over the last three years. The products were sold at Sears, Target, Toys R Us, Walmart, Costco and other retail stores nationwide and online at Amazon.com.